Are you tired of the daily grind? Are you sick of working 8-5, Monday to Friday, but intimidated by the alternatives? Do you just want to enjoy a grand tale of adventure? If so, then you need to watch Austin Vince’s films, Mondo Enduro and Terra Circa. Mondo Enduro and Terra Circa have both been on the market for a while; Mondo Enduro was filmed in the mid-1990s, and released as a TV special in the U.K. shortly after. Terra Circa was filmed around 2001, and released as a TV mini-series in the U.K.; these two pieces of video work have inspired thousands of adventurers (including, allegedly, Charley Boorman and Ewan MacGregor), but it’s surprising how many riders still haven’t seen the films, much less heard of them. I got my hands on copies of both DVDs from Octane Press recently. Here’s what they’re all about. Mondo Enduro kicks off with Austin Vince and friends (including older brother Gerald) embarking on a grand adventure around the world: they’re trying to traverse the globe by the longest way possible, in the least amount of time. That works out to 40,000 miles in 440 days. This route first takes them across western Europe, through Asia Minor, and across the rest of Asia via Russia. During the day they ride through exotic locales, fix flat tires, and meet locals, filming everything along the way. At nights, they cook up a cheap meal and camp under ponchos in the bush, to save money. 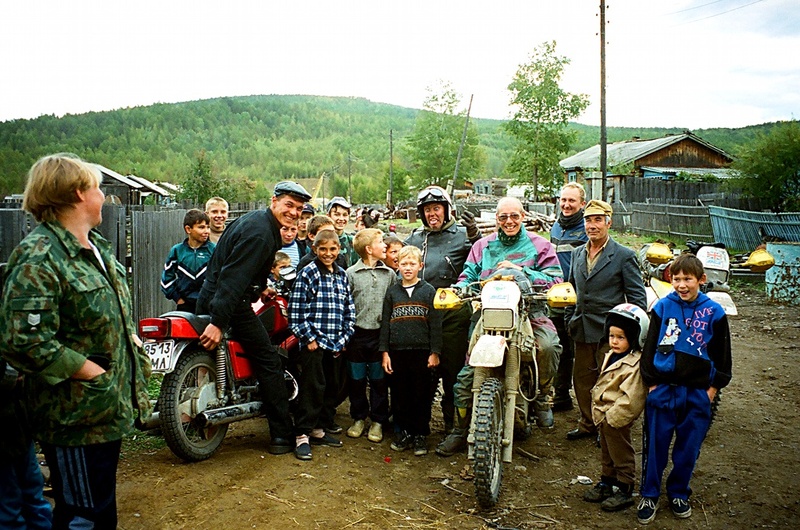 The Russian leg of the journey proves to be the most challenging of the trip; they lose a few riders when they get behind schedule, and some parts of the Siberian wilderness prove too much for their Suzuki DR350s. When you watch this part of the video, you start to wonder how they made it – it must have taken tremendous willpower, not to mention physical toughness, to overcome some of the Russian bogs they get stuck in. Eventually, they end up hitching a ride on a train, taking them to the coast, where they head to North America. The New World proves to be much easier than the old; they lose Gerald due to financial straits, but make good time as they head from Alaska towards South America, where they hitch a boat to Africa. After adding another member to their group there, they rip across the continent northwards towards the Middle East, then Europe, and home. Vince basically had no experience in film-making before producing this, so it’s not a terribly polished production. But, that fits into the DVD’s DIY theme. Instead of glumly gazing out your office window, dreaming of life on the open road, Mondo Enduro preaches that two-wheeled escape is possible for just about anyone. If a hotel worker, a train scheduler, a math teacher and a journalist can have this sort of adventure, all without any sponsorship from big-name manufacturers, you can do it too. Instead of worrying and fretting over the mishaps en route, Vince and Co. show you how to handle these woes as they come. After they destroy a wheel bearing in Siberia, with no spare, they miraculously find one in a roadside cabin, after which, the cabin’s inhabitants throw them a vodka-fuelled party. 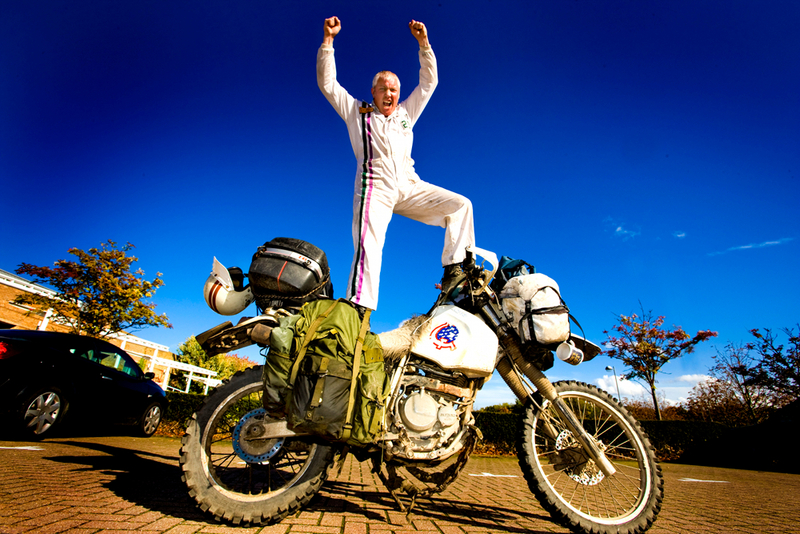 As they ride across Africa, the group has what’s likely their most dangerous incident, as member Clive Greenhough is run over by a bus. The group even handles this brush with death remarkably well; they manage to take care of Greenhough’s injuries with some local help, and a while later, they’re back on the road, battling border crossings and camping roadside in their underwear, and dealing with Vince’s trashed engine (resulting in a 720-mile tow across the desert). Mondo Enduro’s retro theme is also fun; not only is there a warm soundtrack that sounds straight from the ‘60s or ‘70s, but the DVD shows what the world was like before we started buying all these smart phones and GPS units. Back when this was filmed, the Iron Curtain had just fallen, and nobody knew what lay on the other side. Now, you can just Google it. It’ll cost you around $30 to buy Mondo Enduro. If you’re interested in motorcycle touring, you should buy it, even if you’ll never ride the world. Chances are, though, you’ll be considering the idea after watching the film. 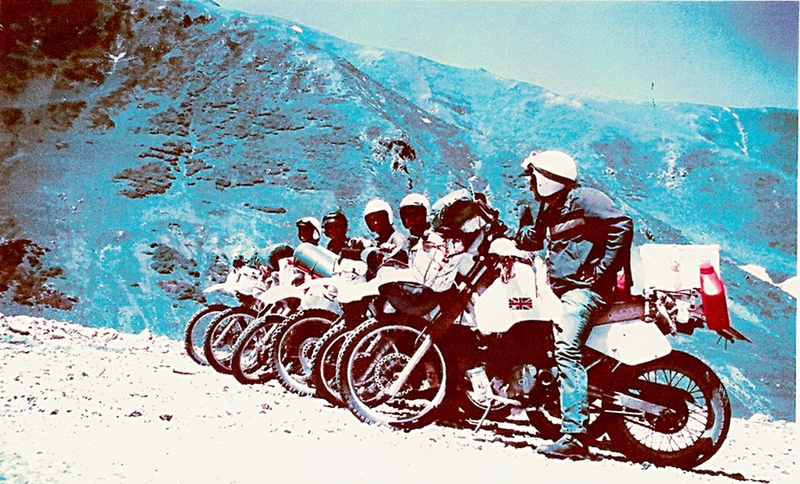 A few years after the Mondo Enduro adventure, Vince and a bunch of his friends were at it again with their DR350s, on an expedition organized by Dave Greenhough (Dave’s brother Clive had been on the original round-the-world trip). This trip takes the riders through roughly the same rote across Europe, western Asia, and Russia. Some riding conditions have improved and nobody ends up in a border crossing lockup this time, but a knee injury takes Greenhough out of the mix, and another rider ends up breaking his collarbone miles from civilization. 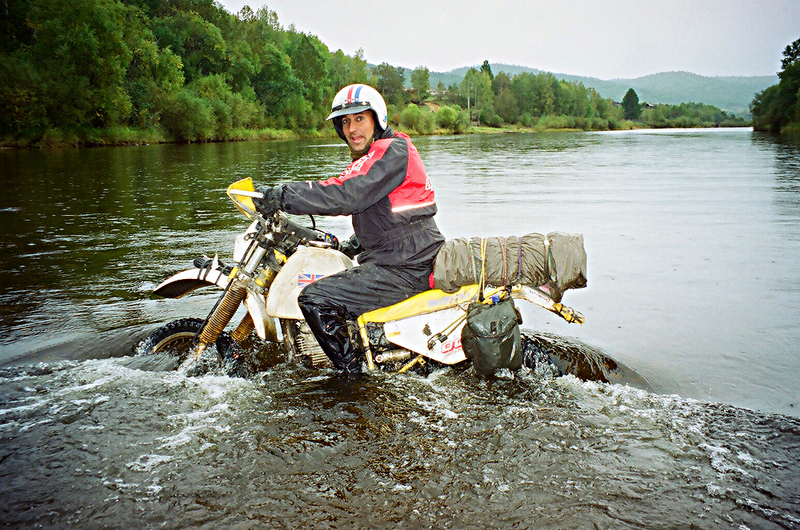 Once again, you’re left wondering just how the riders successfully made it through Russia, as they ford river after river in their cross-taiga quest. After conquering Russia and picking up the injured Matt Hill, they scam their bikes into Japan. Surprisingly, their rough-around-the-edges camping ethos works well here, as they lay out their sleeping bags on pristine beaches and in a vacant hotel that looks like something from a groovin’ mid-70s Bond film. Really, the scenes of riding in Japan are a surprising highlight of the film – the miles of bridges and tunnels look like a motorcyclist’s dream. After Japan, they sail once more to North America, ride across the U.S., then sail home. The American leg of the journey is the DVD’s greatest weakness – it’s too short. The group’s tour across the U.S. is summed up in about five minutes, while the other legs fill up about 95 per cent of the film. 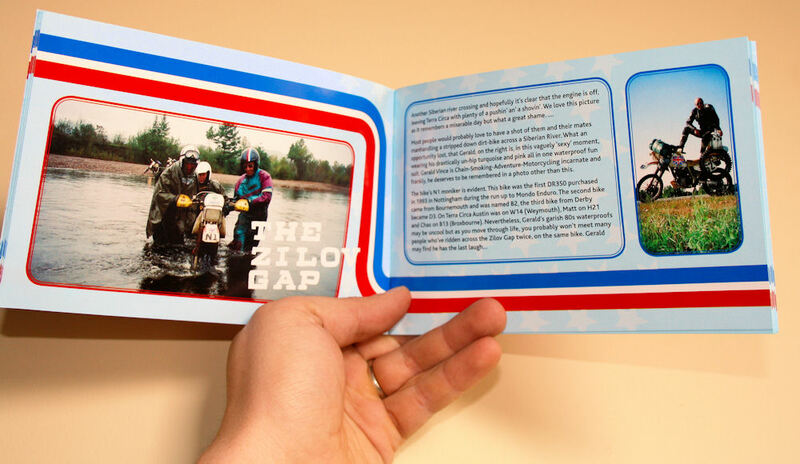 According to the extremely amusing booklet included with the DVD, the group had some fantastic adventures in the U.S. as well, and it’s a pity we can’t see them. Aside from that, though, Terra Circa is every bit as enjoyable as Mondo Enduro. While the riders are a bit better prepared (mainly due to tough experiences on the first ride), there are plenty of the mishaps along the way, which of course make the trip more interesting. The soundtrack is a little more modern, the camera work is definitely better, and the storyline moves with more focus than their original film. The DIY theme of the first film is present in Terra Circa as well. Nobody on here is a carefully-coiffed Hollywood star (although Vince inexplicably sports a tonsure). There’s no 4×4 support vehicle following. Instead of highly technical riding gear, Gerald Vince sports a hideous rainsuit from the ‘80s. They eat on the cheap and camp with army surplus equipment. If they can do it, you can too. Terra Circa will also cost you around $30 to buy. It’s a great buy as well, if you’re into motorcycles, touring, or old-fashioned adventure.